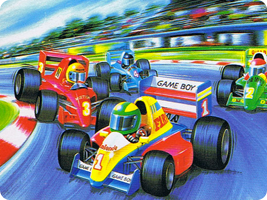 Before companies had to license the F-1 name for racing games, Nintendo's F-1 Race for Famicom was a fast-paced arcade racing game in the Pole Position mold. Speed around circuits and place first ahead of the computer controlled opponents. A sequel was later released on the Game Boy, becoming the first 4-player link-up title for the handheld.